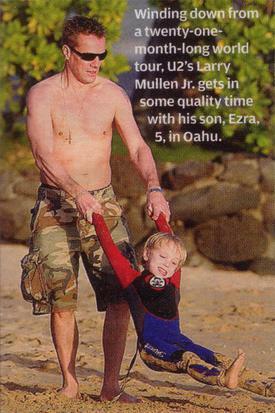 Rolling Stone has published a photo of Larry Mullen with his youngest child — a son that little is known about — on the beach in Oahu, Hawaii. According to the music magazine, the boy’s name is Ezra [mental note: contact U2faqs.com with update]. All we know about the boy is he’s darn cute, just like his daddy.